Having grown up with a sister who was diagnosed with Type 1 diabetes at age 11, I have first-hand experience with the struggles and the importance of proper management. As a home care nurse and later a hospital case manager I have seen the many complications and the severe outcomes caused by poor control. Diabetes, an ancient disease, has afflicted patients for centuries. It wasn’t until 1922 when Insulin was discovered that an effective drug therapy was available to patients suffering from this fatal disease. Insulin completely changed the management of this diabetes. Insulin completely changed the management of diabetes. The first oral medication was developed in 1956; and today there are multiple new meds and types of insulin to treat this disease. 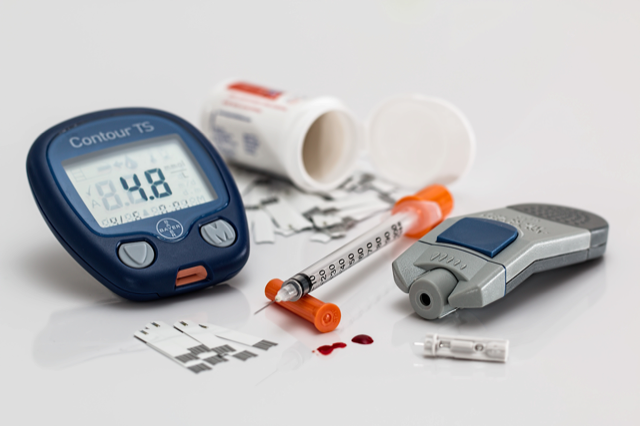 Proper blood sugar control reduces the risk of vascular complications such as kidney disease, nerve damage and visual issues, heart attack, stroke and cardiovascular disease. Glucometers can be used at home to closely monitor blood sugar – normal blood sugar is 100 or lower. A blood test called HbA1c shows the average blood sugar over a 2-3 month period. Normal A1C is less than 5.7. Scientists believe prolonged elevation in blood sugar can damage blood vessels as glucose will stick to proteins, cell structure, blood fats and platelets. Proteins stick together causing the membranes around small arteries to thicken. Less oxygen then reaches tissues and waste products build up resulting in organ damage. This worsens over time if sugar remains high. Patient education and continued support at initial diagnosis is most important and can lead to improved compliance.